Like the Sony RX100 before it, the Sony RX100 II found favour amongst discerning photographers looking for a high quality compact camera that will slip into a jacket pocket. What sets the RX100 series apart from most other pocket-sized compact cameras is that it has a 1-inch type (13.2×8.8mm) sensor that’s significantly bigger than the 1/2.3-inch (6.16×4.55mm) and 1/1.7-inch devices in most small cameras. While the RX100 and RX100 II are set to continue, Sony is introducing the RX100 III as the ‘all-rounder’ compact camera thanks primarily to the addition of a built-in viewfinder. 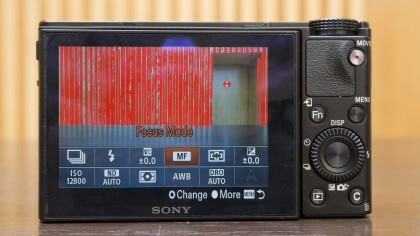 This is an electronic device, which consequently will show the impact of settings changes, and should make composing images easier in very bright light when the main screen on the back of the camera is hard to see. 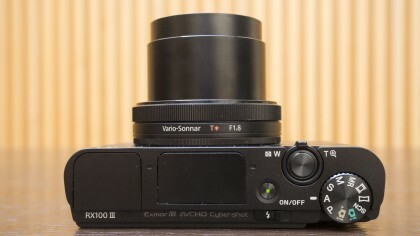 There is an optional external viewfinder for the RX100 II, but naturally, having a built-in finder is preferable. In this regard, Sony has opted for a SVGA OLED Tru-Finder with 1,440,000 dots. In addition, the 3-inch, 1,229,000-dot main screen remains tiltable and non-touch-sensitive. However, the degree of tilt has increased to allow the screen to be raised up through 180 degrees so that it can be seen above the camera from the front to allow selfies to be taken more easily. 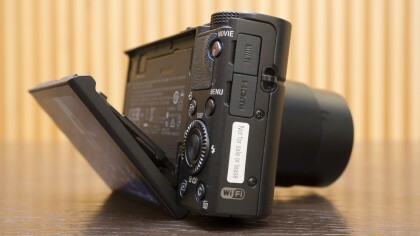 As before, it also tilts downwards for use when shooting overhead. 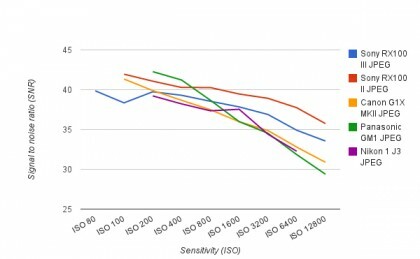 Sony has stuck with the same 20.2-million pixel count and Exmor CMOS sensor as the Mark II version for the Mark III, but the new Bionz X processing engine enables sensitivity to now be set in the range ISO 125-12,800 with 25,600 available in Multi-frame noise reduction mode. The RX100 II topped out at ISO 12,800. Bionz X is three times faster than Bionz and this means that the RX100 III starts up a little quicker than its predecessors. It also brings the benefit of Sony’s diffraction reducing technology and improved area specific noise reduction. There’s also been a change to the lens. The RX100 II has a Carl Zeiss optic with an effective focal length range of 28-100mm (3.6x zoom) and with a variable maximum aperture of f/1.8-4.9. The RX100 III lens is equivalent to a 24-70mm f/1.8-2.8 (2.9x zoom) in full-frame terms. While the loss at the telephoto end may be lamented by some, the gain at the wide-angle end will be widely appreciated, making the camera a better choice when shooting in confined spaces or for landscape and street photography. That large maximum aperture throughout the focal length range also makes the camera more usable in relatively low light without pushing up the sensitivity level. Additionally, it should mean it’s possible to restrict depth of field when you want to. Sony has also improved the RX100 III’s macro capability, since the closest focusing distance has been reduced from 55cm to 30cm at the telephoto end of the lens. It remains 5cm at the wide-angle end. Low-light usability is claimed to be further enhanced by the improved 5-axis image stabilisation system. There’s also a manual focus assist option that enlarges the relevant part of the image and focus peaking to display the areas of highest contrast, as well as a zebra display that indicates which areas are liable to burn out. 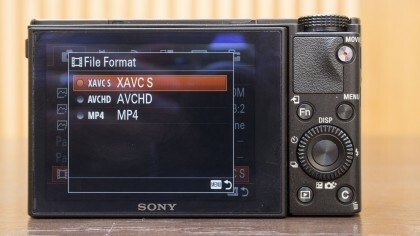 In another change from the RX100 II, the Mark III can record video in XAVC S format, a variant of the XAVC format used by professional videographers. In addition, video is created from full-pixel readout at 50Mbps for better image quality. While there is no 4K video output, it is possible to output 4K stills via an HDMI micro lead for better quality images on 4K TVs. Like the RX100 II, the RX100 III has Wi-Fi connectivity and an NFC chip to aid connection with NFC enabled smartphones and tablets. But it is now also compatible with Sony PlayMemories, enabling apps to be downloaded for expanded functionality. In other respects, the RX100 III spec sheet is very similar to the RX100 II’s, although there’s no hotshoe for attaching an external flashgun. Images may be saved in raw or JPEG format, or both simultaneously and there are advanced exposure modes (shutter priority, aperture priority and manual) along with options to suit less experienced photographers. The original RX100 and the RX100 II that followed it have a 3.9x optical zoom lens with an equivalent focal range of 28-100mm. This gives them a very useful everyday zoom range, but the maximum aperture at full zoom is quite restricted at f/4.9. 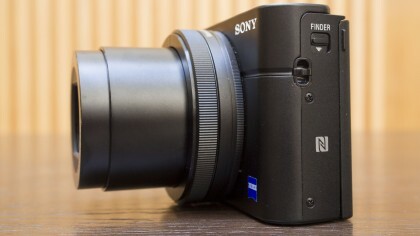 The RX100 III, however, has a new and different lens. It has a shorter, wider 2.9x zoom range equivalent to 24-70mm, but a maximum aperture of f/1.8-2.8. It doesn’t go quite as long as the previous versions, but it goes a little wider and maintains a high maximum aperture all the way through the zoom range. All three RX100 models have a 20.2-megapixel 1-inch CMOS sensor, but with the RX100 II Sony introduced a new ‘back-illuminated’ version. In this design, the sensor’s electrical circuitry is placed on the back of the chip not the front. This leaves the photosites unobstructed, and Sony claims they now have 4x the light-gathering power. The RX100 I and II use a regular BIONZ processor, but the RX100 III has a more powerful BIONZ X processor which, amongst other things, increased the ISO range for the latest camera. The original RX100 has a decent enough ISO range for most purposes, but the new back-illuminated sensor in the RX100 II boosts the maximum ISO from 6,400 to a much more respectable 12,800. Thanks to its BIONZ X processor, the RX100 III can go higher still, to a maximum ISO of 25,600. 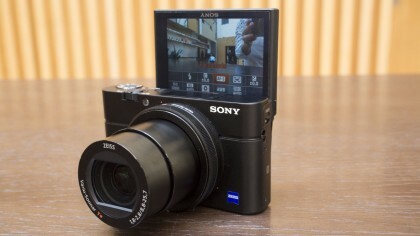 There’s been a gradual evolution of the rear LCD display on the RX100. The screen size and resolution has stayed the same, but where the screen is fixed on the RX100, the RX100 II adds a tilting mechanism for waist-level and high-angle viewing. The RX100 III takes it that little bit further, extending the tilt range to a full 180-degrees, so that you can see the screen from the front of the camera. The screen on the back of the RX100 cameras is good, but there are still times when an electronic viewfinder would be useful. On the original RX100, that’s not an option, but you can get an add-on EVF for the RX100 II. 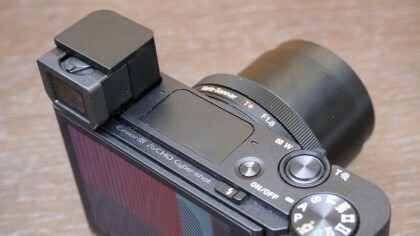 The RX100 III, however, has an EVF built in. It’s a pop-up unit activated by a switch on the top of the camera – you then pull out the eyepiece a few millimetres for viewing. Amazingly, despite its continued development, the height and width of the RX100’s body has not changed through all three versions. The RX100 III has a slightly thicker body, but only by a couple of millimetres so you’re hardly likely to notice the difference. Despite the addition of the electronic viewfinder (EVF) the RX100 III is a very similar size to the previous model – it is just 2.5mm wider and 9g heavier. 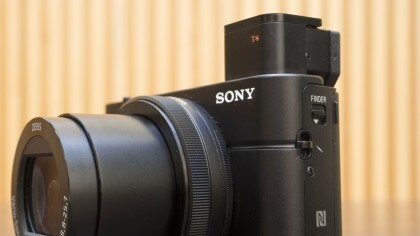 Sony has also kept the new camera’s design and control layout almost identical to that of the RX100 II. Thanks to its metal chassis, the camera still has a sleek appearance and solid feel. It’s comfortable to use one-handed and feels nicely balanced. To maintain the pocket-friendly shape of the RX100 line, the Mark III’s electronic viewfinder (EVF) is a novel pop-up device. Activating it is a two-step process: firstly the switch on the side of the camera is flicked to release the finder, then the rear element of the eyepiece has to be pulled back. Once it’s fully extended (only about 5mm or so), a dioptre adjustment control is revealed on the top. The second stage of the EVF activation comes as a surprise to many, but they quickly realise that something is wrong as the view through the viewfinder is very blurred until the rear element is pulled into place. Though quite small, the EVF provides a nice detailed view, with the active focus points or face recognition boxes highlighted. This is especially useful in bright light when the screen can be hard to see. As there’s no eyecup it’s possible to see a few elements of the scene around the viewfinder. This can be advantageous, but it’s also rather distracting. Helpfully, the EVF has a sensor that detects when the camera is held to the eye to activate it and turn off the LCD. Also, by default the camera powers-up when the EVF is popped-up. The LCD screen provides a clear, sharp view and the tilting mechanism seems sturdy. In order for it to be tipped up properly into the front-facing ‘selfie’ position, the EVF needs to be collapsed back into the camera body. By default the camera enters Selfie selftimer mode when the screen is flipped right up and a count down from three is shown after the shutter release is pressed. Like the RX100 II, there’s a mode dial on the top of the camera to give quick access to shooting modes, including the enthusiasts’ favourite aperture priority, shutter priority and manual, along with program, fully automatic and panorama options. The useful MR (Memory Recall) option is also still present to allow users the store and access their favourite set-up. The zoom is operated via a switch around the shutter release button and there’s a ring around the lens that can be used for making settings adjustments. This can be customised, but many experienced photographers are likely to want to use it for adjusting aperture. Sony has changed the purpose of the Shooting tips/Delete button found on the RX100 II and made it a Custom button on the RX100 III. Marked with a ‘C’, this can be set to access one of 43 different features including options such as white balance and aspect ratio. I found it useful for accessing Focus Area to allow AF point selection. Setting the AF point isn’t complicated, but it’s not quite as quick as I’d like as you have to access the Focus Area option and then press the OK button to confirm the mode selection before the AF point can be selected via the navigation keys. A touchscreen would make it quicker, but the eye sensor would have to respond quickly to avoid the photographer’s nose making the selection. There’s also a function (Fn) button that gives access 12 key parameters such as sensitivity, flash settings and white balance. This selection is customisable so that users can set it to reach their favourite, or most commonly used features quickly. The default options are a good starting point, but I found it useful to use it to access the image quality options so that I could turn off raw shooting and allow the Picture Effects (Toy Camera, Pop Color, Posterization, Retro, Soft High-key, Part Color, High Contrast Mono, Soft Focus, HDR Painting, Rich-tone Mono, Miniature, Watercolor and Illustration) to be used. It’s a shame that Sony still doesn’t allow these effects to be applied to JPEGs captured at the same time as raw files. As before, a ring around the lens can be used to set aperture by default, but this can be customised to adjust other settings if preferred. It’s a nice way of working with a compact camera. Even if your smartphone doesn’t have an NFC chip, it’s easy to connect it to the RX100 III’s Wi-Fi system to transfer images wirelessly. Smart Remote Embedded is also available in the camera’s Application list to enable it to be controlled remotely. Remote control is limited to exposure compensation, focal length, selecting self-timer and tripping the shutter, but it’s a useful feature. It would be simpler if you could connect the phone to the camera and then select what you want to do – transfer images or take remote control. We have been very impressed with the Sony RX100 line to date, so it’s good news that the RX100 III uses the same 20.2Mp sensor as the RX 100 II. Generally speaking, the RX100 III produces natural, yet vibrant looking images that look very good straight from the camera. Examining images from the RX100 III taken at the lower sensitivity settings reveals that they have lots of sharp detail. As usual, viewing the images at 100% shows that as sensitivity rises some of the detail is lost. The JPEG files have very little, if any, colored speckling visible even at the highest sensitivity values but there’s a stippled texture visible. By ISO 6400 images look like they are being viewed through stippled glass at 100% on screen. There is, however, little sign of smearing. Sony’s approach to noise control may not look great when images are viewed at 100%, but the results are pretty impressive at more normal viewing sizes. Noise is concealed in a way that manages to maintain the impression of detail and consequently, even images taken at ISO 12,800 look good at A3 size. One of the main benefits of shooting raw files is that it’s possible to control the amount of noise reduction post capture when the images are processed. Without any noise reduction applied the RX100 III’s high-sensitivity raw files have fine coloured speckling that shows no sign of banding and is randomly distributed. Careful processing enables more detail to be retained than is present in simultaneously captured JPEGs provided that you don’t mind a little noise being visible. 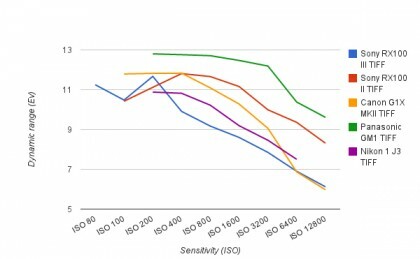 I found that the RX100 III’s general purpose Multi-segment metering system copes well with a range of conditions, delivering well-exposed images in a range of conditions. Naturally the exposure compensation facility is useful on some occasions, specifically when shooting very bright subjects such as a seascape under a bright sky, but it isn’t required in any situations that you wouldn’t expect it to be needed. I left the Dynamic Range Optimiser set to automatic for the majority of this test. This system analyses the scene, adjusts exposure and processes the image on an area by area basis to retain more information in highlights and shadows. I found that the Auto settings works well in most situations and it can even help produce decent looking images when the exposure has been set incorrectly. The RX100 III produces natural looking colours in most situations and the automatic white balance system copes well with a range of natural lighting conditions. In shade, for example it produces neutral looking images that reflect the conditions and don’t look too cold or too warm. If you want a little more warmth the Sunlight setting works well. My first impressions of the RX100 III’s AF system were good and I have not been disappointed during this test. The camera is able to identify its target and get it sharp pretty quickly even in quite low light. It would be nice, however, if selecting the AF point you want to use was a one-stage process rather than two. Compared with the focal length range of some compact cameras the 24-70mm (equivalent) of the RX100 III may seem a little restricted to some, but it’s a popular option on SLRs. The wide-angle end is great for landscapes and confined spaces, while the telephoto end produces flattering portraits. What’s more with a maximum aperture of f/1.8 at the shortest focal length and f/2.8 at the longest point, it’s possible to restrict depth of field when you want to. ISO 12800. Click here for full resolution image. As part of our image quality testing for the Sony RX 100 III, we’ve shot our resolution chart. If you view our crops of the resolution chart’s central section at 100% (or Actual Pixels) you will see that, for example, at ISO 100 the Sony RX 100 III is capable of resolving up to around 28 (line widths per picture height x100) in its highest quality JPEG files. With the exception of the hotshoe, Sony has kept all the good points of the RX100 II and has made some requested improvements. The sensor is a good performer and it’s paired with the excellent Bionz X processor. The addition of an EVF is a major bonus that helps with image composition in bright light and makes it easier to concentrate on the image. The extension of the LCD screen’s tilting facility also makes the camera more desirable to selfie-lovers and the automatic countdown in ‘selfie mode’ is useful. It is especially impressive that Sony has managed to add the EVF as a collapsible unit that doesn’t disrupt the sleek lines of the camera and only adds about 2.5mm to one dimension. However, the two-stage erection process of the EVF doesn’t seem especially sleek and a little ‘unSony’. 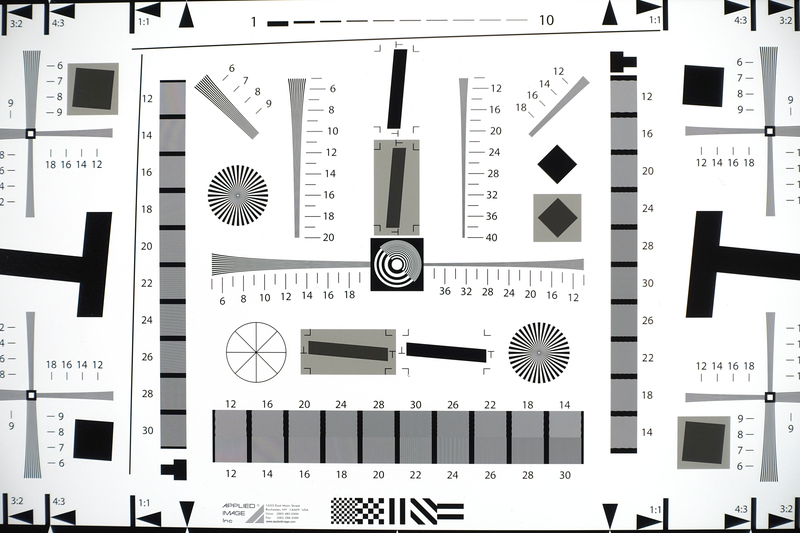 It is necessary to give the correct distance between the viewfinder elements, but the movement needs to be automated so that it pops out under its own steam. The RX100 III’s small size means it can be slipped into a jacket pocket or handbag and carried everywhere when you don’t want to carry a larger camera. Thanks to its 1-inch sensor it’s capable of recording high quality images and the wide maximum aperture enables good control over depth of field. Sony has given the RX100 III an impressive level of customisation so that users can access their favourite features quickly. The default settings are good and changing them only takes a few seconds. In addition, the camera is compatible with Sony’s growing collection of PlayMemories Camera Apps that allow extra functionality to be added to the camera. While we like the fact that the RX100 III has an electronic viewfinder, most people that we showed it to failed to recognise that the rear element had to be pulled out after it was popped-up. When we explained it was necessary they weren’t especially impressed. This is a shame as the viewfinder is actually pretty good and it makes the camera much easier to use in many situations, especially in bright light. 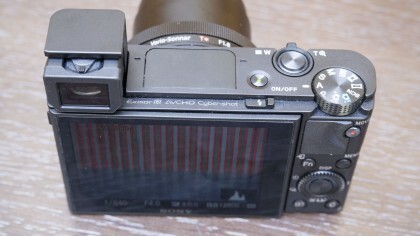 As with Sony’s other cameras, the RX100 III cannot shoot raw files when the filter effects are being applied to JPEGs. What’s even more annoying is that raw capture must be turned off before the effects can be selected, it would be easier if selecting a filter turned off raw recording (with a warning). With a powerful processor like Bionz X we could reasonably expect that filter effects could be used when shooting simultaneous raw and JPEG files. It would also be nice to see a touchscreen to allow quick AF point selection and settings adjustment. Sony is continuing a trend set with the RX100 and RX100 II, seeing the RX100 series as the compact camera for those stepping up from a smartphone or basic compact, the RX 100 II being for those who want something a little more and better image quality. The RX100 III is the ‘all-rounder’, for those who want the convenience of a compact camera, high image quality and a viewfinder. While we’re not entirely happy with how the viewfinder is activated, the RX100 III is an excellent camera. It is generally easy to get to grips with, pleasant to use and is capable of capturing high quality images throughout its sensitivity range.